on November 24th (Photo courtesy of NBC News). The tense situation in Eastern Europe further worsened Saturday, when Turkish authorities detained four ships under the Russian flag when they attempted to dock at Samsun Port, on the Black Sea. The vessels were seized on grounds of false documents and safety violations, and after completing repairs and paperwork, all but one of the ships were released. The fourth ship will be released Monday. This comes in retaliation against a similar aggressive move made by Russia last week, when five Turkish transports were barred from selling their cargo at the Russian port of Novorossisk. After submitting to port inspectors, these ships were also released. The Russo-Turkish relationship has been deteriorating recently, ever since the Turkish Air Force shot down a Russian Su-24 running operations in Syria on November 24th. 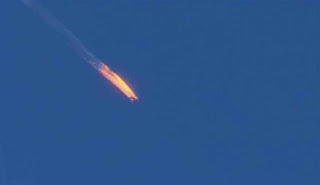 According to BBC News, the claims by the Turkish government do not match those of the pilot of the downed aircraft. The Turks claim that as two planes of unknown allegiance approached Turkey, they were warned to change direction 10 times, over a span of five minutes. When the planes finally did violate Turkish airspace, an F-16 patrolling in the area launched an air-to-air missile which downed one of the craft. The pilot of the plane was killed by Syrian rebels after he ejected, but the navigator survived, saying afterward that they had received no warning before being attacked. Russian President Vladimir Putin invoked the US after the attack, asserting that the US Military could confirm the Russians' claim that the fighter had never entered Turkey. The state department denied this, however, maintaining that Russia had never informed them of the flight. US military officials took a somewhat neutral position, saying that there were indications that the plane did enter Turkish airspace, and were in fact warned to change their heading – but that they were only in violation for few seconds. This shaky situation is now perpetuated by the inspection and detention of Russian civilian ships in the Bosporus Strait, a natural waterway – vitally important to international trade – connecting the Black Sea to the Mediterranean. Turkey claims that the Russian ships are damaging the environment, giving them the right to detain them. They also cite resolutions from Montreux Convention, which allow for Turkey to search civilian vessels if there is any suspicion of smuggling or arms transportation. Although most experts agree that Turkey is unlikely to fully block Russian transport through this strait, these and the other aggressive acts on both sides only help to prolong already unstable circumstances.